Over the course of the past decade, the field of mathematics learning disabilities (MLD) in the United States has evolved significantly. 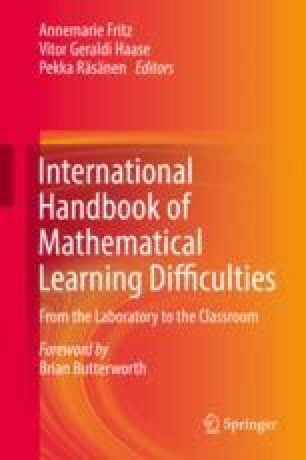 This chapter highlights key contributions that have affected screening and intervention in the United States in two crucial areas of mathematics education: core number competencies in the early grades and fractions in the intermediate grades. We discuss studies that identify powerful predictors of and influences on MLD for both of these areas and detail the long-term impact that failure to acquire knowledge in these areas may have on mathematical development. We also discuss validated screeners for detection of potential difficulties with whole numbers and fractions, respectively. Finally, we describe results from recent intervention studies indicating that these skills can be improved in many children with or at risk for MLD. The contributions represent findings that are influencing educational practice in the United States. Council of Chief State School Officers & National Governors Association Center for Best Practices. (2010). Common core state standards for mathematics. Common Core State Standards Initiative. http://www.corestandards.org/Math/. Accessed 25 Jan 2017. Organization for Economic Co-operation and Development. (2012). Results from PISA 2012: United States. https://www.oecd.org/unitedstates/PISA-2012-results-US.pdf. Accessed 27 Jul 2017.